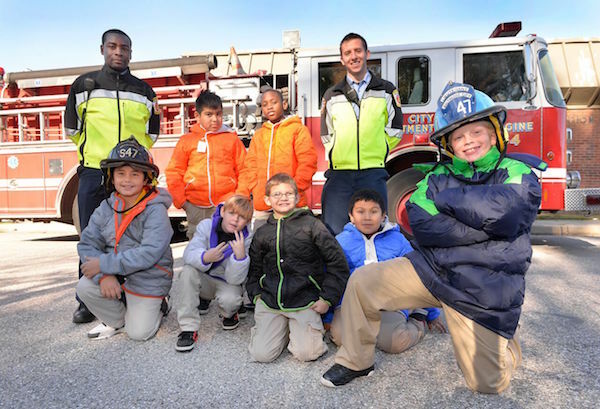 In 2012, a new partnership was formed with the International Association of Fire Fighters (IAFF) to provide winter coats to needy children and their families. Today, Fire Fighters for Operation Warm (FFOW) has grown to hundreds firefighter local partners throughout the US. This partnership led us to initiate production of coats in the USA. Domestic manufacturing has added a new dimension to our primary mission of providing coats to impoverished children: helping Americans get back to work and out of poverty Operation Warm and Coats for Kids Foundation distributed 60,000 Made in USA coats nationwide last year, doubling the scope of our Made in America program. Fire Fighters for Operation Warm helps children in poverty survive and thrive, and inspires hope for children living in poverty in the United States and Canada. Coats for Kids Foundation, established in 2004 in Alexandria, VA has been a long time partner of Operation Warm, Inc. Founded on similar principles, both organizations have made it their mission to provide new winter coats to children in need. Our shared vision of ensuring every child wearing a new winter coat is healthy, able to attend school regularly and has a strong self- esteem is why Coats For Kids Foundation and Operation Warm, Inc. have united with a goal of serving at-risk children throughout the United States. A rising star in the music industry who has played with James Taylor and Livingston Taylor among others is raising awareness and collecting new coats for the foundation. Seth Glier from Shelbourne, MA, a singer/songwriter begins his 12 shows tonight in Cambridge, MA. The tour will take Seth from Massachusetts, to New York, to Maryland, Virginia, Ohio and Michigan. The complete tour schedule is below. For the Coats for Kids Foundation, this is very special in that we have not had a singer/songwriter helping us raise awareness and help get new coats for disadvantaged kids before. Even more important, Seth will be at the Birchmere in Alexandria, VA on January 6th. We encourage all to attend one of his shows. For fans who do bring a new coat to a show, he will give them a special gift as a way of saying thank you. Once the coats are collected in each venue, they will be taken to a local school the next day and given to disadvantaged kids. Seth also plans to bring his guitar and perform at one or more schools on the tour. Along the way, he will be doing many media events, including a show on XM/Sirius. You can get specific details about the tour from Seth’s website:www.sethglier.com. His music is powerful. We are grateful to have Seth helpin gus help disadvantaged kids. Thank you Seth! There have been many wonderful ways that indivudals and companies have stepped up to raise money for the Coats for Kids Foundation, but this is definitely a first. Mark Berry, a self-described sketch comic/beer pong player and guest on Leno and other TV sho0ws is going to play a 12-hour marathon of the video game Super Smash Brothers on Nintendo 64. His goal is to beat the game entirely with every character on every level. Not being a gamer, this sounds like quite a challenge. You can follow the game and contribute. the game will be live at ustream.tv/channel/markberrylive. All proceeds are fully tax deductible.and will be acknowledged when individuals make contribution via paypal. Target Gives Grant to Provide New Winter Coats for Cleveland Kids! Alexandria, VA — The Coats for Kids Foundation today announced a partnership with Target in recognition of its efforts in providing new winter coats to needy kids. This grant of $5,500 will be used to provide more than 400 new winter coats to disadvantaged kids, identified by Cleveland school social workers. Paul Darby, President of the Coats for Kids Foundation said, “We are grateful and humbled by Target’s grant to our foundation. We believe that the confidence of a leading corporation like Target In our foundation will encourage other corporations to partner with us to provide winter coats to needy kids in their communities. Mount Clemens, MI – SVS Vision Optical Centers has partnered with the Coats For Kids Foundation to provide new coats for children this winter season. To help raise enough funds to purchase the new coats, SVS Vision has created a cookbook filled with recipes provided by SVS Vision employees and suppliers. The cookbook, Cookin’ with Vision, is available at any SVS Vision location for a donation of $10 or more. 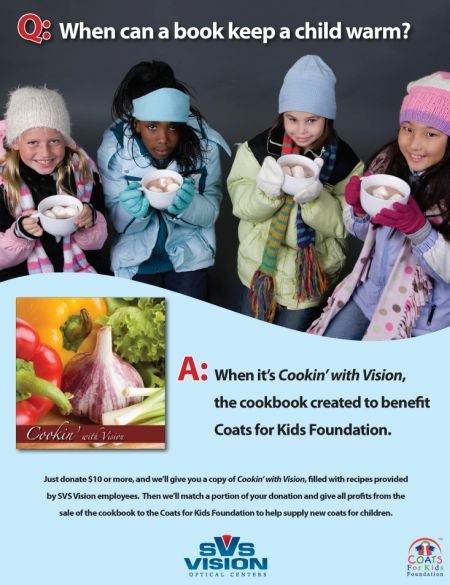 SVS will match a portion of your donation and give all profits from the sale of the cookbook to the Coats for Kids Foundation to help supply new coats for local kids. The goal is to distribute coats to needy kids in Detroit and in the nine other states in which SVS has offices. To find an SVS Vision Optical Center, visit www.svsvision.com or call 800-SVS-4600 (800-787-4600).